Happy Wednesday, friends! I hope you all are having a fabulous week. I have a few new items in my closet that I was able to wear out this weekend. First, I have been coveting a gorgeous statement necklace from J.Crew for quite some time. It is simply gorgeous but I have this rule about statement necklaces - I try to only purchase statement pieces that are under $50 since they are purely costume jewelry. So no J. Crew coral rosette necklace for me (it was ringing in at $148) or so I thought. Enter GroopDealz. A couple weeks ago they posted a knockoff in one of their flash boutiques and I was all over that before it sold out. I'd gotten a manicure on Friday with a gift card one of my sweet kiddos gave me for Christmas so I decided to wear coral accessories all weekend. 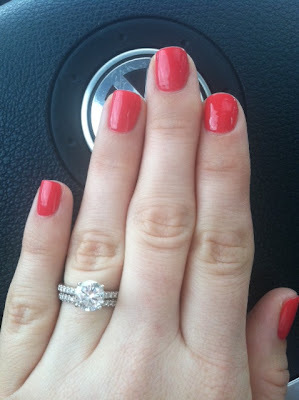 This shade is California Coral by Essie, I believe. On Friday night we did a happy hour and dinner with a few friends. 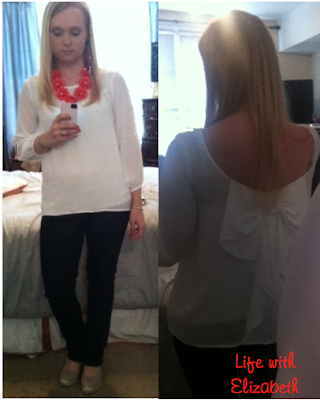 It was so warm during the day that I planned to wear this short sleeve Lilly top. Then, I took Riley out before I left and realized it had gotten really cold really quickly so I ended up wearing a long sleeve version of this top. 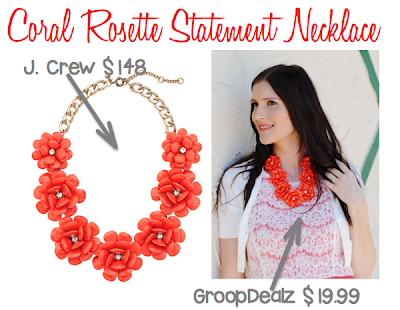 The statement necklace is from Red Dress Boutique. I only documented one work outfit this week. 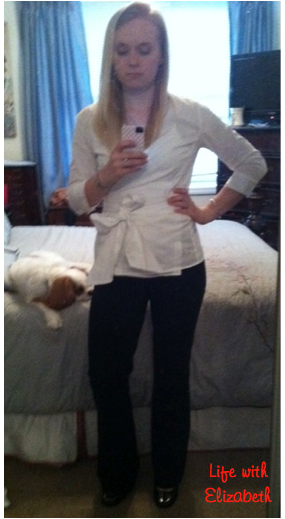 The pants are from Express, the wrap top has a really cute polka dot pattern on it and is from Banana Republic. I wore my TB Sophie wedges that Corey gave me for my birthday. 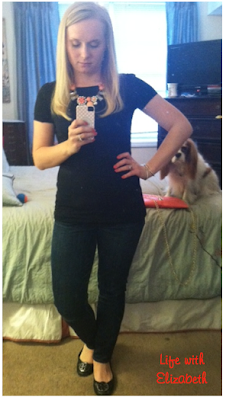 So Kerri and I have been chatting about the linkup and we really want YOUR opinion. What do you think so far? Is this something you like seeing weekly or do you think you'd prefer if we posted WIWW less often? How can we motivate you to join in? 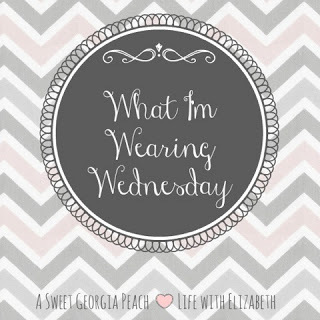 You are rocking some super cute outfits for school! I'm horrible and just stumble out the door most mornings, haha! I'm the same way when it comes to statement necklaces. I can't justify spending that much money on something I may not wear in a year or so. I wore a really similar outfit the other day - my white bow back top with my rose necklace! :) Love your style!! 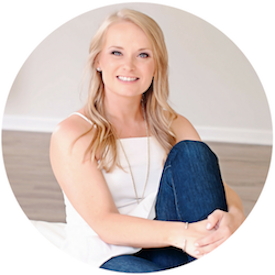 Wife + mom navigating life, motherhood, marriage, and healthy living one cup of coffee at a time. COPYRIGHT © 2011-2017 ALL RIGHTS RESERVED TO CAROLINA MRS. BLOG. PLEASE BE AWARE THAT ALL WEBSITE CONTENT IS COPYRIGHTED AND MAY NOT BE REPRODUCED IN PART OR IN WHOLE WITHOUT WRITTEN CONSENT FROM THE OWNER. IF YOU WOULD LIKE TO REFERENCE A POST, PLEASE PROVIDE PROPER CREDIT AND IF YOU WOULD LIKE TO USE A PHOTO, PLEASE CONTACT ME FOR CONSENT.